The far Left can't go five minutes without a comparison between Donald Trump and Adolf Hitler. But like President Trump or not you, there’s no way to rationally draw an ideological line between him and Hitler for many reasons. Trump’s rise to the presidency was completely different than Hitlers in a very significant way. Their policy differences also leave little doubt that these two are fundamentally different on a root level. Let me explain. Trump was elected democratically. Hitler was not. In fact records show that the NSDAP only received about 35% of the vote. The difference lies in how democracy was set up in Weimar Republic Germany. Most importantly it was not a two party system as ours is. In fact it had a multitude of parties with the communists, social democrats, Catholic Center party and numerous other parties. In fact Hitler never “ran” for office. He tried to seize power violently in 1923 for which he was arrested. In 1933 a coalition government was formed by the majority conservative aligned parties in which Hitler, to placate his vote of 35%,(constituting the largest power block belonging to a single party in Weimar), was put in as Chancellor. This was in the hopes of controlling him which failed following the burning of the Reichstag and the death of President Paul Von Hindenburg in 1933. Hitler quickly granted himself and his party more and more executive power in response to what was a genuine crisis facing Germany in the form of the Moscow backed German communists. Hitler's brutal reign of oppression and suppression would follow immediately after. Why is this important? Because we need to know what we're talking about when comparing and contrasting. Like Trump of not being a populist or a nationalist doesn't make one “literally Hitler” unless George Washington, Charles De Gaulle and Winston Churchill were also Nazis. 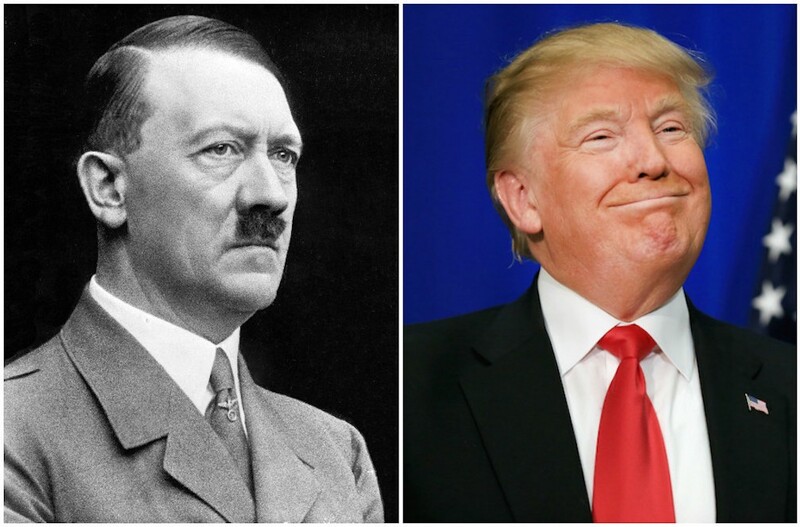 Donald Trump began his campaign, (something Hitler did not ever do), and won himself by a electoral vote,(again something Hitler did not do as he was appointed),. He has made no rapid moves to ascribe to the executive branch undue amounts of power nor has he exercised his power in such a way as to lack precedent. Rhetoric alone does not a dictator make and it is important to note that Hitler did not allow criticism of him. There was no Bill Maher show to incessantly mock him. There was no Twitter or YouTube and there certainly was not a women's March in Berlin. Another thing to note is the lack of racial policy. By 1937 Hitler and his party had passed the Nuremberg laws, regulating activity and rights open to Jews and other undesirables and activities not open to them. In fact Trump's son and law and daughter and grandchild are Jewish. It has been a year and a few months since Donald Trump has taken office. Yet there has been no work towards a racial policy. Many claim his speeches pertaining to illegal immigrants are really dog whistles about Mexicans. This comment however, is riddled with racist assumptions. The first is that all Hispanic people you see are Mexican, the second is that all illegal aliens are mexican and the third is that illegal immigrants are a separate race. In order to be “racist” one would need to hold that one race is superior to another. Illegal is an immigration status not a race and if you're assuming without proper evidence that it is a dog whistle you are acting by unbiblical principles. Beware the Christian who froths at the mouth about Trump’s racism. Trump ran on an almost isolationist campaign promising to pull out of NATO if other nations didn't pay up and other comments made about our involvement in the middle East. He has since reneged on these promises but if we're comparing him to Hitler one must know what Hitler promised and did. From the onset Hitler promised military expansion and lebensraum in the east, (Russia and the Baltic states),. He also promised to regain/gain lost German lands and populations in Czechoslovakia, Poland, Austria and Eastern France. Trump has not talked about expansion of territory. He has spoken about rebuilding the military but so did Bush, Reagan, Nixon and Kennedy. Nobody called them Hitler, wait yes they did. What needs to be understood is the left's constant reliance on the “Hitler” card. I've seen it done in conservative circles as well but nowhere near as much as leftists do and the thing about it is that that creates more Hitlers than at any time since 1945. We are fueling this. In my case leftist propaganda certainly fueled my pre-Christian beliefs. If one pulls up on Google statistics about right wing hate groups we will quickly find a BBC study saying that hate groups are on the rise in the u.s. The main source of their belief? Southern Poverty Law Center. The same people that cite everyone to the right of Bernie Sanders as holding Nazi sympathies. This includes Focus on the Family and Milo Yiannopoulos, the Gay, Jewish, British conservative commentator who makes constant jokes about his preference for interracial relationships. This is not to justify his actions but it is to highlight how ridiculous the SPLC’s system of classification is. Ben Shapiro is also on their list. Both men have had college students riot to prevent them from speaking. The doublethink it requires to call the opposition Nazis while rioting and burning your own campus to prevent two Jewish men from speaking is astounding. The SPLC says that there are over 1,000 hate groups operating within the u.s with over 10,000 members. This is against an overall population of 324 million people in the u.s. which means about .03% of the u.s population is a member of a white supremacist group. This in comparison to Islamic extremism in the world. There are over 1.9 billion Muslims in the world in which it is estimated that 7% is engaged in extremist violence. That's 75 million people engaged in holy war. That is accounting for only those who engage in violence. The unknown number of sympathizers must be large indeed. In the united states there 9.9 million Muslims, of which is 3.75% of the overall u.s population. Let's apply the conservative estimate of 5% to active jihadis for the u.s population. That is 450,000 men and women who have possibly been radicalized. However, Muslims are still a minority in the United States. Look at other nations where they are not. France and England notably. In fact of you look at statistics more British Muslims have joined ISIS than have joined the British armed forces. Yet if you look up hate crimes in the U.S Charlottesville is the first to come up. However, that is amongst the slew of other notably false hate crimes such as the woman who claimed three male Trump supporters ripped her Hijab off on a New York subway. Police resources were wasted investigating this crime and it was proven to be false. No charges were brought against the woman. Nothing more was said but numerous people went on believing this crime happened. The news sources that so eagerly reported this crime, CNN, MSNBC and many others were slow to or downright refused to print or report a retraction. In fact these fabricated hate crimes are all too often brushed over as genuine with no consequences. Charlottesville is high profile however. And it gets granted a huge amount of scrutiny. Like them or not America grants everyone a right to free speech and these men and women were granted the right to rally before it was unfairly retracted for political motivations. When they went ahead ANTIFA,(a noted terrorist organization that uses violence to accomplish it's ends), disrupted the rally violently causing a reaction. I have seen the first hand videos. The punch a Nazi in the face slogans and the bottle throwing. Blocking highways and attacking people. Yet these are considered to be single incidents to the media. The Charlottesville incident however, that is a condemnation of Trump and his supporters, (who are all neo Nazis to the media),. Celebrities are in on it as well. From Ashley Judd screeching that the ghost of Hitler is in the white house to Jim Jeffries screaming profanities at Piers Morgan saying “Hitler didn't kill Jews on the first day” we can see Hollywood flipping. In fact no anti semitism can be traced to Trump himself which is odd for a Nazi. He's painted by an association he has disavowed numerously. A disavowal from president Trump however, is not enough. He must spend his presidency atoning for it. In fact he has to spend his presidency not doing what he campaigned for to make the left happy. But Obama escaped his association from the hateful Jeremiah Wright and Terrorist Bill Ayers without a sigh. The media said that he was a separate individual and couldn't be painted as one. But Trump is guilty solely on his supposed associations. When it comes to Trump’s comments about African Americans none can be found. In fact he only cited source of his anti African racism is a comment with foul language about “*blank* nations”. The left’s reaction was scathing. In fact I saw many posts saying “he calls OUR nations that”. Two leftist dogmas are defeated by this assumption. The first is that any nation “belongs” to any group of people. The idea that African nations belong to unique African people is racist and discriminatory. The second is that immigration is good because these people have horrible chances in their own nation and need better lives. If Trump was wrong, and Somalia is really a sparkling Paradise then there is no need for immigration. Leftists in their Hysteria cannot even keep their stories straight and will find any excuse to justify their own preconceived notion of President Trump. They assume his motive and then look for evidence to support their verdict instead of vice versa. Why is Hitler so polarizing though? Especially to leftists. The spectre of Stalin, who killed 20-30 million people, or Mao who killed 60 million should be more polarizing. Even Che Guevara, whose face can be found on leftist t shirts, is the perfect anti progressive. He was the executioner at La Cabantuana prison and oversaw 2,500 executions ranging from political enemies to homosexuals and kids who listened to rock and roll. Che even said that “the black is indolent and lazy and spends his money frivolously”. Yet Jay Z wears his face on his shirt. What makes the Austrian painter the most horrifying in a century of secular violence? Utopia is my answer. Hitler's Utopia is different than the one leftists hold. His was racial while theirs is classless. That is why everyone against them is racist and their heroes are unblemished. Nazis have grown in number but nowhere near the level of hiding under every bed. The alt right is doomed to failure as they are not homogenous and not a dedicated party. Every evil has its roots in Godlessness and every evil and sin is cured at Calvary. I left that life behind me because Christ's love for me is greater than my hatred of others. To anyone who feels these things. To feel disenfranchised, hated or alone I hope you hear me and most of all I hope you hear Christ. From the Nazi to ANTIFA none of us are clean and our hatred and violence towards each other proves. Your Utopias are built upon sand and will crash with the surf. Only the Lord has the way. God bless all of you. Addicted to Social Media? There is Hope! Why Moderates Can't Save Us From "Extremism"